“Hungary’s Left Party (Balpárt) expresses solidarity with the Greek people, who have been robbed and afflicted by austerity measures. We support the Syriza party, which is capable of replacing the corrupt political elite and can say ‘no’ to the forces of the international financial markets, to the European Commission, to German Chancellor Angela Merkel and to the European Central Bank”–read the statement of Hungary Balpárt. Mr. Tamás also had some sharp words for the mainstream Hungarian centre-left opposition and for its continued enthusiasm for Ms. Merkel. Mr. Tamás noted that the German chancellor is known for her total lack of vision, lack of creativity and her support of the status quo. 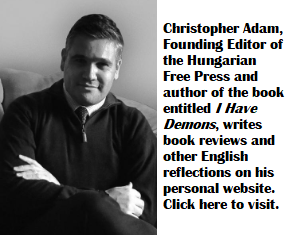 Yet the Hungarian mainstream left sees her as some sort of kindly, stable old aunt, mainly because the Hungarian centre left also lacks vision and courage–according to Mr. Tamás’ assessment. 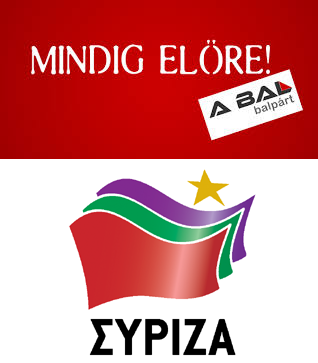 Balpárt and Syriza. Two far-left parties. Syriza has led its main, centre-right rival–Prime Minister Antonis Samaras’ New Democracy party–in every poll published so far this year. The most recent opinion poll, released by Vergina TV the day before the election, puts Syriza at just over 30%, while New Democracy trails at 24.6%. The overtly neo-Nazi Golden Dawn party (which actually makes Jobbik look somewhat tame on most days) comes in at 5.5%, while a new centre-left, but pro-EU party called To Potami (The River) polls at 5%. The Gree Communist Party (KKE) will likely pass the threshold for parliamentary representation with 4% of the vote. Syriza would need to garner around 38% of the vote to win a majority in the legislature. Failing this, it will most likely form a coalition with To Potami, which is expected to soften the radical’s left’s image and tone down some of the anti-austerity and anti-euro rhetoric. The other option is a possible coalition with the hard-line communists of the KKE, but this historic far-left party doesn’t seem to have an appetite to join Syriza in government. A piece in Newsweek explores why Syriza is likely to either moderate its stance on austerity and is very likely to distance itself from any notion that it aims to pull Greece out of the euro, in order to reintroduce the Drachma. According to the piece, Syriza may be pulled apart by a leadership that is moderating its message and by a loud, far-left activist base, which wants out of the euro. Mr. Tsipras has already started to change his tone. While he claims that a vote for Syriza will finally end Greece’s “national humiliation” at the hands of Ms. Merkel and the European Commission, he also addressed a letter to “German taxpayers,” which was much softer in tone. He will have some tough negotiations ahead with the so-called Troika, and he may face rebellion within his party at home, including from the likes of politician Rachil Makri, who wants a new Syriza government to unilaterally print €100 billion, in order to maintain the country’s liquidity after it rejects austerity measures. Hungary’s radical left–which is still very small and on the fringes of both the political scene and in terms of media exposure–used the impending Syriza victory in Athens to send a message to both Europe and to the Hungarian centre-left opposition. “What starts in Greece now could change the whole Europe! The neo-liberal era could end soon, which pushed our societies into social and financial crisis, thanks to the regular urge for constraints. The Hungarian political elite ignores what happens in Greece. The government and the opposition parties are against change in Europe. In Hungary, a lot of people believe in Mrs Merkel and in her politics, who encouraged mostly the continuous Greek constraints”–noted the activists of Hungary’s Balpárt. Of the “mainstream” Hungarian left’s politicians, only András Schiffer, the leader of the Politics Can Be Different (LMP) green party, attended the radical left-wing protest. One wonders if Mr. Schiffer will realize his long-standing goal of uniting the Hungarian radical left into one camp, in order to change the landscape in the opposition….much like what Mr. Tsipras did in Greece. Very good and relevant article. Why is called someone far-leftist just because opposes austerity measures dictated by the rules of the eurozone, that largely serve the interests of Europe’s most powerful economy? Some economists ( and not far-leftists , but not far-right neoliberals either ) say that having euro is in essence like having the deutsch mark as a currency. And why would be someone counted as far-left anyway, if the orthodox-leninist KKE don’t consider them leftist enough? Is keynesianism far-left? Wow… I would rather say, that a really far-left popular force would advocate the transfer of the means of production into the hands of those who are working with them, and dismantle the system of wage labour ( wage slavery ) and the monetary system as well. In other words, it would end capitalism and that is the far-left policy. It is not Greece that moved to the left, but Europe moved increasingly to the reactionary ( sometimes far or even fascistic/nazi ) right. And of course the Putin or Merkel/Obama loving Hungarians are anti-humane, social darwinistic, racist, antisemitic, reactionary assholes; Hungary is one of the most reactionary right-wing countries of Europe and even the World. In Cyprus the likewise leftist AKEL ( Progressive Party of the Working People ) party has formed the goverment several times, and the world didn’t end as a result. But for example in Iceland too, the goverment did not follow the policies “recommended” by the EU “Troika” after the financial crisis in 2008 and they are now much better-off than the Greeks. The Icelandic financial crisis ended as early as 2011 with the end of the IMF bailout program and since then, there is modest economic growth and one the lowest unempolyment rates in Europe. Compare this with the “fruits” of what the Greeks were bullied to accept on the orders of the “Troika” – in essence Germany. It is like revenge for the lost WWII, and indeed Greece has never been in a so much serious economic-social situation since WWII and the Anglo-American provoked civil war that followed ( perhaps not even under the otherwise anti-people, fascist military-junta in the late 60-s early 70-s ) … Thanks EU and Germany! A balanced budget has no merit of its own – we know this since the time of Keynes. It has to be weighed off against the state of aggregate demand, employment and income. This very important lesson has been totally lost track of, by the current EU enforcers of Say’s defunct Law, for whom a 3% deficit is carved in stone and must be maintained even if a member state goes down the sewage pipe as a consequence. Having said that, I do not believe the answer lies in going back to another 19th century relic – Karl Marx – whose time has also passed, and who offers no solutions to the challenges faced by humanity at this time. I’m afraid, that Mr Tamás, for all his admirable qualities, is barking up the wrong tree again, and not the first time, I may add. One of the first things the Greeks should learn to do is to pay their taxes. Hungarians could also benefit from the same advice. The second thing, they could do is make their tax systems more egalitarian – which at this time, they are manifestly not. Thirdly, both countries need to be cleansed of the rampant corruption and inequalities of opportunity and wealth that is sapping their strengths, and character. Fourth, they should embark on a well thought our national economic development strategy, based on a consultative approach, rather than the approach that tries to BBQ as quickly as possible the goose that may one day lay their countries’ golden egg. And finally, they need to fix their political systems that are democratic only in name, rather than in substance. A huge proportion of EU funds end up in the pockets of corrupt local elites. There is no need to throw the baby out with the bathwater. Much could still be done within the paradigm.